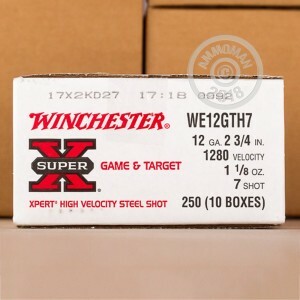 This 12 gauge ammunition from Winchester is designed to perform well against various types of small game ranging from squirrels to small birds. Each shell in this case of 250 fires 1-1/8 ounces of #7 steel shot at a muzzle velocity of 1,280 feet per second. 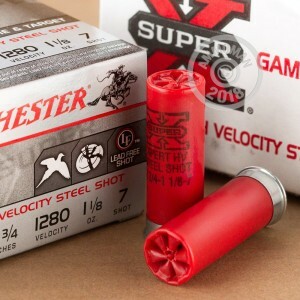 The steel shot used in this ammo makes it suitable for hunting in areas where contamination from lead shot is a concern. 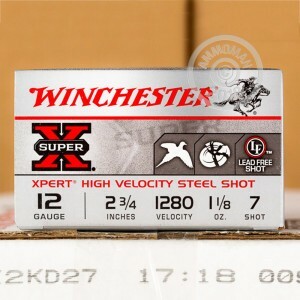 Winchester Super-X shotshells are loaded in Oxford, Mississippi. They use reliable 209 primers and enjoy a great reputation for delivering tight patterns with relatively low recoil thanks to their hinged wad design. Get free shipping at AmmoMan.com with any order over $99!